Founded in 2002 and based out of Charlestown, WV, American Public University is an online educational institution designed to meet the needs of students interested in public service-related programs such as criminal justice, public safety, and national security, in addition to many other aspects of today’s job market. The University claims to have over 10,000 registered students from all walks of life, including first-timers, transfers, graduate and international students, as well as returning alumni. 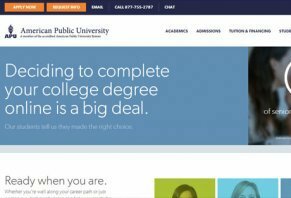 American Public University claims to provide affordable online education, and has been acknowledged by the Sloan Consortium for best practices in online education. In addition, APU is accredited by the Higher Learning Commission, and is a member of the North Central Association. Instructors at American Public University hold credentials from institutions such as the University of Notre Dame, Stanford University, and Harvard University, while many others are executives in the government, business, and non-profit sectors. An introductory video that outlines many of APU’s features can be found here. American Public University has structured their learning format so that it is flexible, and allows students to work whenever is most convenient for them. Students can log in at any time, day or night. Once you’ve enrolled and signed up for a class, all you’ll need to do is simply log into your APU Online Campus using your student ID and password. There, you’ll have access to all of your classes, weekly assignments, academic forms, course announcements, grades, the ability to engage in discussions with peers and instructors, and more. Unlike many other universities (online or otherwise), APU begins new classes on a monthly basis, and regardless of the number of students enrolled in the class, you’ll never have to worry about getting dropped. In addition, American Public University claims to have an industry-leading library that provides access to more than 100,000 electronic books, 30,000 journals, as well as a wide variety of tutorials and open web programs. APU claims that the combined cost of tuition, books, and fees are about 19% lower for undergraduates, and 33% lower to graduate students, when compare to average in-state public university costs. When compared to the top 10 online education providers, APU claims they are 42% lower for undergraduates, and 33% lower for graduate students. Undergraduate programs are $250 per credit hour, and $750 for a three-credit course. Graduate programs are $325 per credit hour, and $975 for a three-credit course. Audits are $300 for a three-credit course, and $400 for a four-credit course. For a complete breakdown of APU tuition and fees, please visit their information page here. See Related Article: Is On-Campus or Online Education the Right Choice for you? Write a Review for American Public University!